This is one of the best cakes in my repertoire. It has a very intense apricot flavour. Preheat oven to 170˚C/gas 3. Butter, flour and baseline a 23cm cake tin. Cream the butter and sugar in a mixer until fluffy, then add the marzipan and blend. Add the eggs gradually, beating well. Beat in the vanilla and the amaretto. Sift the flours, salt and bicarb of soda and mix with the almonds. Fold the dry ingredients into the batter gradually, alternating with spoonfuls of sour cream. Don’t let it get too dry. Fold in the apricots and spoon into the tin. Bake for about 1 hour 20 minutes. A skewer inserted into the middle should come out clean, but don’t overcook. Leave to cool for 15 minutes; run a fine knife between the cake and the tin and turn it onto a wire rack. Leave to cool. For the topping, mix the yogurt and cream, then stir in the jam, with the mixture loose enough to create a marbled effect. 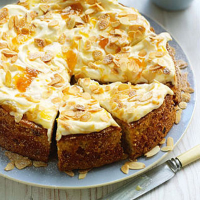 Spoon on top of the cake and scatter with the toasted almonds. Dust with icing sugar. This sweet wine has soft-fruit flavours and a nutty character to match the cake’s amaretto and almonds. De Bortoli Noble One Botrytis Semillon 2006 New South Wales, Australia. Bin 57198; £14.99.